There has been a flurry of dismissals in the news. Folks in the church coming out in support of marriage equality and LGBT inclusion have lost their job, their faith has been attacked, they have lost positions or removed from their churches and denominations. The chaplain at Wheaton College fired, a professor at Fuller lost his job over the issue, a Methodist pastor lost his position when he decided to marry his partner, a gay school teacher fired from a Catholic school. All in the last few months! He asks those of us who are gay and Christian as well as those who are supportive and still remain in the church. An easy answer would be that I never experienced church like that, this was not the Christianity presented to me as a kid. I grew up in the Presbyterian Church USA and the predecessor of the Evangelical Lutheran Church of America. I won’t say that they were inclusive as denominations in the early and mid 90s when I came out. But the student ministry I was a part of then, was. Individual churches, campus ministries, and brave individuals laid the ground work for inclusion in the wider denominations. And before that as a kid, the Gospel as they preached it (or at least as I received it) was always about God’s love and inclusion. They were not places to hear about hell and judgement, but rather God’s acceptance. As such I did not grow up with self loathing. 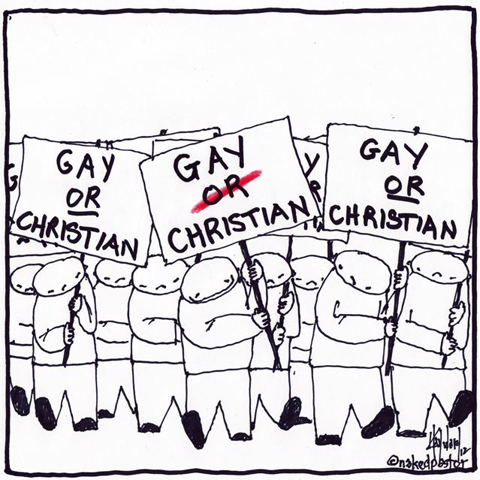 Nor where there barriers, in myself, or in the church, when I sought to reconcile my sexual orientation and my faith. Of course that doesn’t answer the question for other conservative denominations that were never likely to move on this issue, such as those highlighted by Adam Lee as he asks “Wouldn’t it be easier just to be an atheist? You’re enormously less likely to face institutional resistance or discrimination.” I can’t speak for them, but I’m going to guess beyond the fight or flight reaction, there are other reasons for staying. For one, we could believe in the reality of God. We could have had personal experiences or could be persuaded by philosophic arguments like I was. But even as we wish the church was more LGBT inclusive, being an atheist is not on the horizon for many of us. It could be that most of our experiences outside of this issue have been positive. The liturgy, worship, the relations in the life of the community. The intellectual and practical resources of the Christian tradition that connects with us. It takes a lack of imagination to find it hard to believe that there are LGBT folks who remain in the church even as they fight for acceptance. Folks are multidimensional and no area of life captures the whole of us. Anyone who joins or leaves the church, becomes an atheist or a theist, or changes religions has had a preponderance of events, reasons, that added up over time, well before the decision was made. That kind of imagination or what Henry Nelson Wieman calls “appreciative awareness” of the other is needed more than ever as we ask folks to consider these issues from another perspective, to change policies, to move to greater levels of acceptance. It’s the basic ingredient in interfaith dialog, in getting theists and atheists to understand each other, in crossing any kind of divides that mark our society. Nurturing this in whatever context we find ourselves in, whatever our beliefs and background, will be key to the many issues we face in the 21st century. PS. Thanks David Hayward at Naked Pastor for the graphic! The church I was attending at the time was one of the founding members of the Association of Welcoming and Affirming Baptists, and soon became a magnet for LGBT people from all over. One of the things that struck me about our new members was how many of them were involved in one or another of the “helping professions.” It was as if they’d taken their experience with non-acceptance and oppression to heart and expanded it to cover anyone who’d experienced those and other hurts and their consequences. I’m in awe of people like them, who refuse to become bitter but instead keep on keeping on in faith, hope, and love despite it all. In particular, the LGBT couples the church attracted could have taught straight couples a thing or three about relationships and commitment. Some of those couples had been together for 20 years or more. Even now I’m left speechless by a love that says, “I love you so much, I’m willing to risk having the whole world hate me for it” and makes it work while straight couples are falling apart over pressures that seem trivial by comparison. So I say, those who take the 19th century word “homosexuality” and try to plaster it onto the Bible to condemn people and things they don’t understand can go take a flyer. I’ve experienced amazing Christlike love in action in my LGBT Christian friends, and I only wish more straight people could be more like them.